In a field of maize, no two leafy stalks of multicolored corn will look exactly the same, even though they grew from seed cells with identical genetic material. How cells with identical genomes can express different traits is a longstanding biology puzzle. Now, a distinguished team of Florida State University scientists and a researcher from Florida A&M University (FAMU) will work on that puzzle with a new, $1.45 million grant from the National Science Foundation. The cutting-edge pilot study is expected to shed light on the cellular mechanisms that regulate gene expression. In other words, said Florida State molecular biologist Hank W. Bass, the project leader, this study intends to uncover the fundamental principles of how cells manage their genetic information. "What we find will provide insights and valuable comparisons for understanding how other plants and animals regulate their genetic information," Bass said. "It may bridge a gap between molecular genetics and cell biology, and could have important implications for how to study and understand basic processes in humans such as development and disease." In the process, the research could lead to better maize quality and yield. Bass noted that understanding genetic control of processes such as seed development and grain fill have major implications for improving the yield or quality of maize seed. "In corn, the kernel stores food, energy and vitamins," Bass said. "These are the direct or indirect products of gene activity. Findings from this project are therefore likely to have important agronomic implications for improving corn." Bass compares the genome of maize or any other plant or animal to a library, where each book represents a gene. "Libraries have thousands of books, like genomes have thousands of genes, yet only a small portion of the genes in each type of cell are active at any given time," he said. "In the library analogy, only some of the books would be physically accessible — others may be housed in the building, but locked away in a room that cannot be accessed. Genomes also segregate their component genes into accessible and inaccessible genetic material, but the genome is dynamic, rapidly able to reorganize itself in order to change gene activity as required for processes such as progression through the cell division cycle or tissue and organ development. "Our study proposes to combine biochemical and microscopic techniques to access and map the regions of the genome that are accessible versus inaccessible," Bass said. The research is considered vital because genome organization is the prerequisite to its function. On the study's distinguished transdisciplinary team are FSU co-principal investigators Karen M. McGinnis and Jonathan H. Dennis. Florida State recruited the molecular biologists/geneticists in 2008 and 2009, respectively, for the Integrating Genotype and Phenotype research "cluster" that Bass and fellow biologist David Houle helped to develop as a part of the university's ongoing Pathways of Excellence initiative. Earlier this year, McGinnis garnered a prestigious Faculty Early Career Development (CAREER) Award from the NSF. Dennis is a pioneer in the mapping of human chromatin. From 2003-2007, Bass led an NSF-funded project to map genes onto maize chromosomes using advanced microscopic techniques. Joining the team from FAMU's College of Engineering Sciences, Technology and Agricultural Sciences is Professor Oghenekome U. Onokpise, who collaborated with Bass on the earlier NSF-funded maize study. Advanced technology will play a major role in the new research. "My co-investigator Jonathan Dennis has pioneered the use of combined biochemical, genomic and computational techniques to study the functional organization of human chromatin, the complex mixture, including DNA and associated proteins in which gene expression occurs," Bass said. "Surprisingly, maize and humans have almost identical genome sizes and complexities. We have simply substituted maize tissues for human tissues, and the maize genome for the human genome, and plan to transfer the technologies from animals to plants." 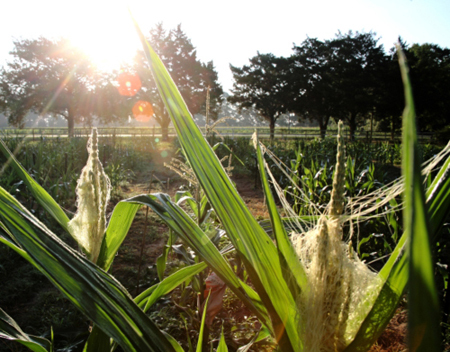 The researchers will develop new tools for identifying how the maize genome is organized at the chromatin level and how its organization changes in response to development and genetic inputs. Mapping all that is a pretty big deal, Bass said. "If one can map how a cell and indeed how an entire plant determines which genes are turned on or off in response to a change in the environment, or the presence of disease, or even during the plant's journey from seed to maturity, it may be possible to affect the outcome," he said. "The National Science Foundation Plant Genome Research Program funds projects such as this to promote truly basic research on fundamental questions like 'How does that work?'" Bass said. "The long-term benefits of NSF-funded research are sometimes unexpected, but rarely disappointing." "The long-term benefits of NSF-funded research are sometimes unexpected, but rarely disappointing."